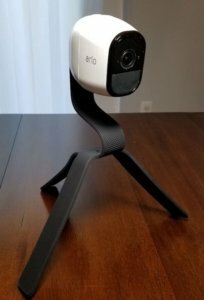 Arlo Pros come out of the box very easy to install and are great cameras all around. You can put it almost anywhere, but trying to balance it on a tree branch is difficult. 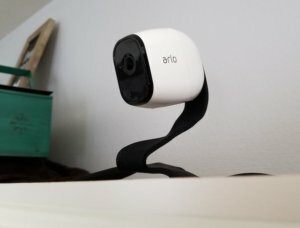 We got our hands on a few Arlo Pro accessories that we found very useful. The Arlo outdoor mount, in particular, is a great addition to the Arlo Pro. 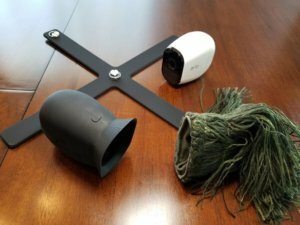 There are a few Arlo outdoor mount and skin options that you will want to look into when installing your camera outdoors. Quadpod: Flexible but sturdy mount that can be used almost anywhere. Ghillie skin: A super camouflage skin. Outdoor secure mount: Reduces risk of theft that comes with the basic magnetic mount. Silicone skins: Protect and hide your Arlo indoors or outdoors. Twist mount: Hang the Arlo from a pole or a branch. Gooseneck design similar to the quadpod. Suction Cup Mount: Stick the Arlo to a window for no wall damage. We tried out the quadpod, ghillie skin, and silicone skins hands-on, and have more details and images of these below. The Quadpod Mount is flexible like a Gorillapod, but more versatile for the Arlo Pro. It can bend into a tripod or it can wrap around a tree branch tightly. This provides more options to place the Arlo and can avoid drilling unnecessary holes in the wall. 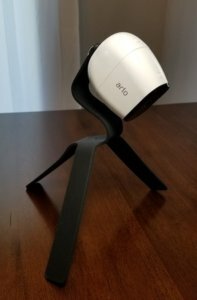 The Quadpod allows you to place Arlo Pro anywhere, but here are a few examples of how it comes in handy. 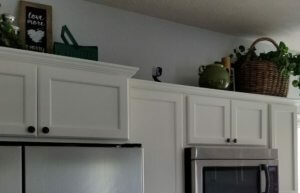 A great place to put the Arlo Pro is on top of the kitchen cabinets where there usually isn’t a power outlet. Sure you could use the included mount to put the Arlo on the wall, but then you have holes to deal with later. If you decide to rest the Arlo on a flat surface on top of the cabinets you will run into another problem. The Arlo will miss stuff below because it is pointing straight. 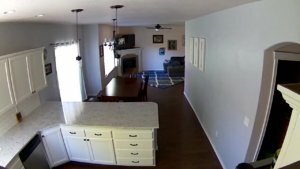 Placing the Quadpod Mount on the cabinets makes it so the Arlo can sit high enough and point down. This will provide a much better angle to view your home. 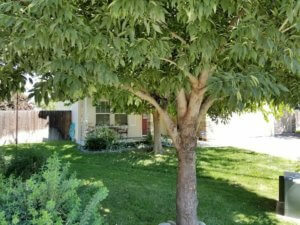 A front or back yard tree can be a perfect spot for an Arlo Pro. 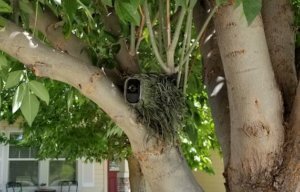 The camera can be well hidden in a tree and cover different angles of your house. The four legs of the Quadpod can wrap around a tree branch and keep the Arlo secure from falling. The Quadpod surprised us in how well it did in our tree. The silicone material makes it really grippy and the legs were long enough to wrap around a large branch. The legs were also very strong so we had no worries that the Arlo would fall out of the tree. The Ghillie skin reminds me of a sniper all decked out in the jungle. This is a good thing because the Ghillie skin does a great job at hiding the Arlo Pro, which is important to prevent theft or tamper by intruders. 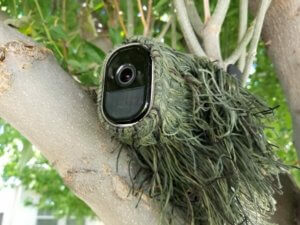 Here is a picture of the Arlo Pro in our tree with the Ghillie skin. Can you spot it? Adding a silicone skin is a great way to protect and hide your Arlo. We covered the Arlo Pro skins previously and have really liked using the skins. They are not expensive and can really make a difference in blending the Arlo into its surroundings, especially since Arlo cameras are bright white and can easily stand out. Since the Arlo is so popular there are plenty of things you can add. 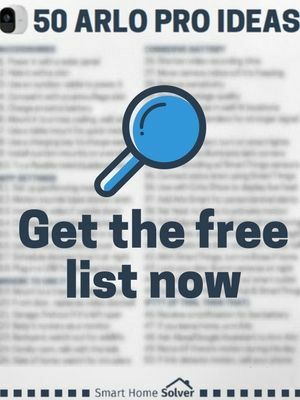 What Arlo outdoor mount accessories do you prefer for your Arlo? Let us know in the comments below!